Enjoy this family-friendly resort right on the doorstep of Yosemite. Naturalist John Muir famously said of the Yosemite Valley, “The mountains are calling, and I must go.” If you, too, hear the call of the wild and appreciate the finer things in life, the luxurious Tenaya Lodge at Yosemite, located two miles from the park’s southern gate, is the ideal basecamp for your family’s next California High Sierra adventure. Chase waterfalls, conquer Half Dome, stand in awe of the natural beauty of the valley, and then retreat to Tenaya for a dip in the pools, sumptuous meals, restorative massages, and endless options for the kids. It’s a perfect way to reconnect with your family while connecting with nature. KidTripster Tip: If you have a fourth grader, this is the year to explore America’s national parks. The Every Kid In A Park program gives every fourth grade student in the United States a free national park pass, allowing the whole family free entry to all federal parks and lands. Students with the pass also get VIP status at Tenaya Lodge with free admission to the Summerdale BBQ and morning nature hikes. Tenaya Lodge knows how to elevate a vacation, naturally. Explore the mountains by bike, “grip it and rip it” at the outdoor archery range, attempt a twizzle at the skating rink or feel the powder on your face on the snowmobile run. You would have to stay weeks to experience everything! A highlight of our family’s wintertime stay at Tenaya Lodge was the two-mile, guided nature walk along a peaceful, snow-covered trail that followed an icy stream. Thanks to complimentary snow cleats that come in every size, no one slipped while meandering the heavily-forested Sierra National Forest. My daughter was thrilled to spot a deer in the woods that morning! The only sleigh rides in the Yosemite area begin and end at Tenaya Lodge. Belgian draft horses pull the sleigh through the woods. This winter-only activity includes a stop for hot cider and roasted marshmallows around the campfire. KidTripster Tip: Each December, get into the holiday spirit at Tenaya Lodge’s popular Gingerbread House Workshop. You’ll decorate the ultimate gingerbread house, selecting from an enormous array of sweets and treats. Cost to build a candy-covered masterpiece: $75. 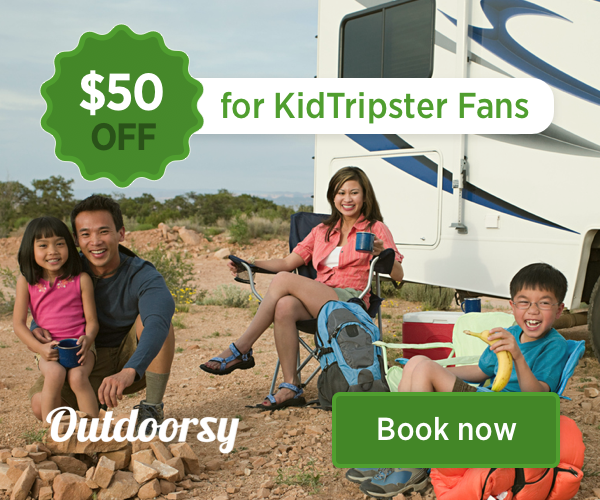 KidTripster Tip: Check with Tenaya’s helpful concierge for free seasonal activities. My children loved the resort’s Elf on the Shelf scavenger hunt! They had fun searching high and low for a dozen elves perched throughout the resort. Tenaya’s Sierra Adventure Kids Club entertains the kids, offering activities such as scaling the resort’s 25-foot climbing wall, mountain biking, archery, arts and crafts, and games, plus lunch or dinner. Our kids liked making new friends, nighttime skating, and ornament decorating, while my husband and I wined and dined at the lodge’s upscale restaurant. Camp cost: Day $50/child; Evening $60/child. KidTripster Tip: Tenaya Lodge is building the first zipline in the Yosemite area, opening in summer 2017. Swim year-round in the resort’s large indoor pool and three outdoor pools, including a kids’ pool with water features, and five hot tubs. Our family swam every night in the heated indoor pool, which helped us thaw out after moonlit snowball fights. Next to the indoor pool, check out the arcade, full of video games, pinball machines, air hockey, and a pool table; it’s a terrific hangout for the teens in your family. Find your bliss in the gorgeous 10,000-square-foot Ascent Spa, my favorite area of the resort. Achieve immediate relaxation in this tranquil, aromatic oasis (although your urge to shop in the adorable boutique will likely kick in). My skin was radiant for days following the Beyond Botox specialty facial. If you are tired from a grueling climb, pamper yourself with the Hiker’s Trek Treatment, a massage/scrub/masque focusing on the lower legs. Those wanting to get in some extra cardio, can sweat it out in the fitness center and use the spa’s saunas and steam rooms. I can tell you from experience that a morning yoga class, followed by a fruit smoothie, is revitalizing for the mind, body and soul! The nearby Yosemite Ski and Snowboard Area, formerly known as Badger Pass, is the oldest downhill ski resort in California and one of the most affordable. Open from mid-December through mid-March, there are lift and rental packages for under $60! It’s a great place for beginners; kids (ages 4 to 6) can learn to ski from a patient instructor through the Badger Pups Program. Yosemite National Park, one of the most extraordinary natural wonders on earth, is also massive. At 1,189 square miles, the park is about the size of Rhode Island! A professional bus tour is the ideal way to be introduced to Yosemite; it’s definitely worth the money! My kids actually listened and learned a little history from Glenn, our congenial Discover Yosemite guide. Your driver will pick you up from Tenaya Lodge in a modern, 14 to 29-passenger mini touring bus, taking you to see and photograph all the spectacular sights: Half Dome, El Capitan, Wawona Meadow, the waterfalls, and everything in between. We took a leisurely stroll up to Lower Yosemite Falls. And lunch in the dining room at the Majestic Yosemite Hotel, formerly the Ahwahnee Hotel, is included. In summer 2017, when the restoration of the Mariposa Grove of Giant Sequoias is complete, bus tours will add the grove and a picnic to the itinerary. Full-day tour cost: Youth (ages 3 to 15) $75; Adult $150. KidTripster Tip: Summers in Yosemite Valley can be like summers at Disneyland with lots of people! During the winter, you practically have the park to yourself! Nearby Oakhurst offers unique California experiences such as riding on a vintage logging steam train and panning for gold. My daughters are begging to return in the summer to “go for the gold!” You’ll want to explore another nearby attraction - the 100 mature Giant Sequoias at Nelder Grove, just a few minutes from the resort. In early 2016, Tenaya Lodge completed an impressive $5-million remodel, refreshing 240 rooms and suites in the main lodge. Our handsome deluxe suite was perfect for our family of four with a roomy bedroom with a king bed and private bath for Mom and Dad and a spacious living room with a sleeper sofa for the kids, who enjoyed watching their own flat screen television at bedtime. We used the suite’s dining room table for a room-service breakfast and later for a little bit of homework. Room rates range from $149 for a deluxe room with two queen beds to $495 for a luxury suite, depending on the time of year. Rates increase during the busier summer months. Traveling with a large family or grandparents? Extended doubles, spa suites or the charming Cottages at Tenaya Lodge are great options for groups. KidTripster Tip: Tenaya Lodge is pet-friendly, complete with dog sitters and a kennel. The resort offers pet packages that include a plush dog bed and chef-made dog treats! Tenaya Lodge’s numerous dining options are sure to please your palate. Whether you want to grab a breakfast burrito at Parkside Deli or witness flaming Bananas Diablo prepared tableside, Tenaya has it. Start your day with The Total Breakfast Buffet fireside in Sierra Restaurant; there’s something for even the pickiest young eaters. Another option is to order off the breakfast menu with house specialties like Huevos Rancheros and California Benedict. We also enjoyed the convenience and tastiness of room service. Who doesn’t like freshly-baked monkey bread in the morning?! For lunch or dinner, go to Jackalope’s Bar and Grill for hearty pub fare and a full bar. Warm up with a satisfying Rueben sandwich or cool down with a crisp Cobb salad, and the kids will love the extensive children’s menu! My husband, a craft beer enthusiast, appreciated South Gate Brewing Company’s popular Tenaya Red IPA on draft. During the summer, dine alfresco on the lodge’s expansive patio, complete with a fire pit, or dig into brick-oven pizzas at Timberloft Pizzeria. While our children played games, got crafty, and ate spaghetti and meatballs at Tenaya’s Kids Club, my husband and I enjoyed a relaxing dinner in the romantic Embers Restaurant. We started with black truffle crust-covered lobster bisque and Caesar salad, expertly-prepared tableside, followed by pan-seared scallops and Filet Oscar, a tender filet mignon topped with artichoke and Dungeness crab. The California-centric wine list is impressive, and you’ll definitely want to save room for dessert. The chefs at Tenaya Lodge pledge to purchase only sustainably-grown produce and seafood and to serve organic fruits and vegetables whenever possible. Bravo! KidTripster Tip: In the days leading up to Christmas, Tenaya Lodge offers a special Kid’s Dinner with Santa package. Kris Kringle and his elves join your family for a holiday dinner your children will never forget. KidTripster Tip: During the summer months, get a taste of the Old West at Tenaya’s Summerdale BBQ with grilled tri-tip, barbecued chicken, burgers, and grilled corn on the cob. The casual evening’s entertainment includes a singing cowboy, kids’ activities, and s’mores made over the campfire. Tenaya Lodge at Yosemite (elevation 5,288 ft.) is located in the Central California High Sierra near the town of Oakhurst, approximately 60 miles north of Fresno and a 3-1/2-hour drive from San Francisco. The easily accessible resort is two miles from Yosemite’s most popular entrance, the South Gate. KidTripster Tip: Keep in mind that during the winter months, snow chains may be required along Highway 41 approaching Tenaya Lodge and the Yosemite Valley. For more on Yosemite National Park in any season, read here. Journalist Wendy Thies Sell, a native of Wisconsin, has called California’s Central Coast home for 20 years. She left the television news anchor desk for motherhood and enjoys the flexibility to travel with her family.